As a teenager I was presented with a silent, bearded, impressively intellectual brother-in-law. Despite a few introductory swimming excursions to Hampstead Ponds he remained too awesome to commune with. His desire to debate every topic rather than pass on to another was unnerving – he reminded me of a threshing mill beating out the last grain of corn from the ear. Over the years I came to know him better and I witnessed his amusement at simple things too – quaint sayings and behaviour of his young daughters, a smile for a cavorting dog. His deep devotion and consideration for each member of his family was obvious. When, as a family, we returned from Africa, Alison and he welcomed us into their home. Jack drove us magnificently through the London traffic and tolerated little savages accustomed to wide open spaces. He even endured a week’s holiday with us all at Butlin’s! As a man of utter self discipline and deep musing, he chose lone activities involving testing interplay with the elements. Running, swimming, diving, cycling, skiing, hang-gliding, sailing – any physical illness or accident was firmly ignored after necessary treatment – he was ever ready to be a winner. In later years when sail boarding was his current passion he recognised that the mountains could match air and sea as equally worthy adversaries. Scottish on his mother’s side, he was drawn to the North and he found quiet friendship with a group of seasoned walkers and climbers who regularly met in Cumbria and the Highlands of Scotland. He loved the ‘camping out’ style of the huts, bothies and bunkhouses and savoured the evening post mortems, discussions and debates on techniques, routes, failures and successes. 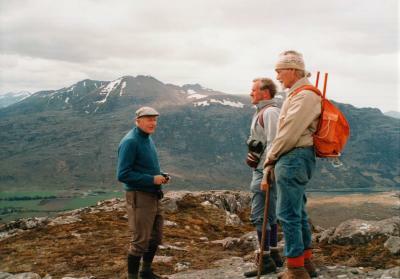 He climbed his first Munro in his seventy second year and he then held a special regard for Buchaille Etive Mhor in Glencoe, climbing it twice again. His favourite haunts were in the Galloway Hills where he made countless exploratory expeditions. He was an ideal companion to walk the hills with – steady pacing, keenly aware of surroundings and weather and munching his home-baked bread hunks with humorous remarks on the day so far – at the end of the day, over his pint and meal, planning the day to come. He was an essentially modest man and on our last expedition in May / June 1994 I was determined to record his presence despite an unwillingness on his part to be photographed. I persuaded him that his figure was necessary to lend proportion to my photographic collection of waterfalls. Somewhere near Shenavall I positioned him for the fourth time; he smiled gently and commented that there seemed to be an unusual number of waterfalls in this glen. As events turned out we have all been grateful for these few reminders of his last holiday. His hill walking companions contributed to purchase, in his memory, technological equipment for use by the Galloway Mountaineering Rescue Team. That worthy man would have approved. How we miss him!